As the Mindanao Culinary Festival (MFC) renowned its 12th year had raised standard in the culinary competitions that was participated by the different schools and colleges in Mindanao. The event was associated with the standards and mechanics of Philippine Culinary Cup (PCC), the admired culinary competition in the country commenced by Les Touques Blanches (LTB) Chefs Association Philippines, the pastry Alliance of the Philippines (PAP) and PEPGroup Inc. In partnership with the Philippine Culinary Cup, (PCC) and SM Lanang Premier, The Davao Tourism Association (DaTA) re-launched the Mindanao Culinary competition and was held concurrently with this year’s World Food Expo in June 25-27 2015 at SM Lanang Premier. With around 130 participants, the event enticed Hotel and Restaurant Management (HRM) and culinary student, restaurant owners, hotels and resort managers, and even the overall civic in Davao City. The student competitions will be participated by 18 schools. They will be competing in gourmet banana deserts, bangus Chinese style cooking, mocktails, fondant cake dressing, napkin folding and bartending, table skirting, table setting, centerpiece arrangement. 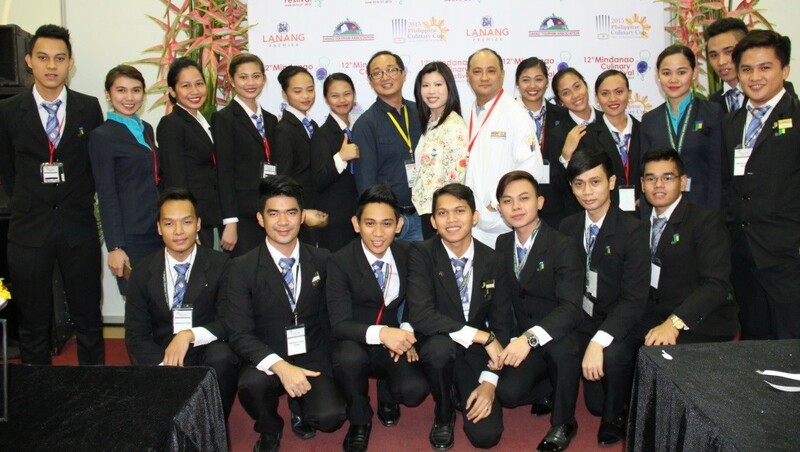 As the President of Davao Tourism Association have accentuated that this year’s affair will advance and elevate the rank in the culinary competitions, as it was affiliated with the ideals and mechanics of prestigious Philippine Culinary Cup, sought to be participated in by the chefs and apprentices nationwide. Chef James Antolin was the overall head of the Culinary Event Competition. The said event was judged by the country’s top chefs involved chefs Jose Gamboa, Fernando, Aracama, Carlo Miguel, Nancy Reyes-Lumen, Buddy Trinidad, Jem Raymundo, Penk Ching-Tan, Jackie Ang-Po, Michael Yap, Brando Santos, Jerome Valencia, Dan Basilio and Morbert Gandler who were all engaged to the different affair categories in the culinary competition. The event was open to HRM and culinary students and certified chefs and apprentices. It serves as the setting to showcase and cultivate talents, skills and provide culinary chances to the participants. Meanwhile, JIB-CBT students had also taken place in the said event. They were the usher and usherettes who assisted the special guests with their necessities all throughout the prestigious event.